Most of the Concrete Repair testing has to do with hardness, bonding strength, cure time and overall finished PSI. The advantage of using a flexible material, such as Percol, is that it has three (3) times the "Modulus Of Rupture" of traditional PCC and as such is more flexible and actually performs better because it DOESN'T meet the required PSI or hardness requirements of finished Concrete. The majority of traditional early strength repair materials prematurely fail because they are too rigid. 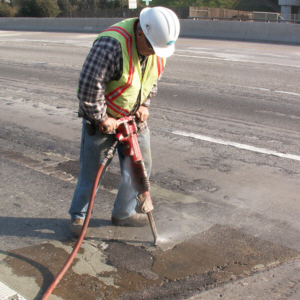 Rigid repair materials installed in a rigid pavement require that the materials have similar coefficient of expansion. Most do not and, as a result, destroy the repair and the surrounding concrete. Additionally, load transfer, between the repair and the surrounding cementitious material is easier to achieve because of the flexibility and enhanced load diffusion properties of the flexible repair material. GeoSet, along with our Percol Polymers (i.e. Percol Dopey Soup, Percol Elastic Cement), provide a flexible repair that will deflect as surrounding concrete expands and contracts, rather than destroy it. Though it deforms under load, GeoSet along with our Percol Polymers (i.e. Percol Dopey Soup, Percol Elastic Cement), have memory and as such will return to its original form. When we describe the material and why it works, we always say it's almost like installing a small shock absorber into the concrete that helps absorb the load at point of impact (a large heavy truck for example) and facilitates that transfer of energy, from the moving object, to the rigid pavement. With a traditional cement repair, that "Shock Absorber" principle is not applicable. 1203 PERCOL Elastic Cement is a machine dispensed polymer for concrete spall repair and overlays. Combined with aggregates forms high performance, rapid setting flexible polymer concrete. Within ten minutes, durable repairs are ready for traffic. Withstands vibration, heavy traffic loads, and thermal movement. Also available in 21 oz Dual Cartridge Kits P/N 1206. Click here for 21 oz Cartridge Mixing Instructions. Click here for Technical Data Sheet and mixing instructions. Click here for Safety Data Sheet. 1205C PERCOL Concrete Welder is a machine dispensed or cartridge dispensed polymer for restoring cracked concrete. This low viscosity, rapid curing polymer penetrates hairline cracks. Cracks 1/8" and wider are filled with sand then saturated with Concrete Welder to form a high strength polymer concrete. Spalls are repaired with 1/4" to 1" aggregates depending on size and depth of spall. Concrete Repair Aggregate Topping Sand is Also Available for Anti Skid Wearing Surface to Keep Your GeoSet Concrete Slurry, Concrete Welder, and Elastic Cement Polymer Gray. Use for an anti-skid and wearing surface by topping the repair (while wet and before set up of polymer or slurry) with our Concrete Topping Sand. Mix your materials and apply as you would with our standard process. Use topping sand generously on the GeoSet, Concrete Welder & Elastic Cement Polymers with our Concrete Topping Sand. When the material has set up, sweep off access sand and your concrete repair is ready. We recommend that you use our specially-coated sand because it bonds better to our products than other sands. If a gray repair is essential, use Concrete Topping Sand! Available in 12 pound bags. Machine dispensed polymer for restoring cracked concrete. Hand dispensed with the Hand Operated Dual Cartridge Gun.